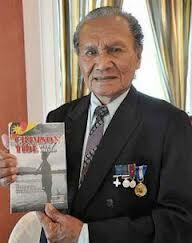 Awang anak Raweng, an Iban Scout from Sarawak in Borneo, won the George Cross for gallantry as recorded in the London Gazette on 20 November 1951. the only Sarawakian bestowed with the highest British gallantry award.King George bestowed the 83-year-old veteran from Nanga Skrang, Sri Aman with the George Cross on Nov 20, 1951 in recognition of his bravery in fighting the communists all by himself after he and four other British army personnel were ambushed in Kluang, Johor on May 27, 1951. He was attached to 10 Platoon, ‘D’ Company, 1st Battalion Worcestershire Regiment in Malaya when their jungle patrol was attacked by 50 communist terrorists in Johor, Malaya. Two members of the platoon, the leading scout and the section commander, were killed while Awang was wounded in the thigh. Despite his injury he pulled Private G. Hughes to cover. Awang returned fire, repulsing every attempt by the bandits to advance, despite suffering a severe wound to his right arm. As the bandits surrounded the injured pair, Awang clasped a grenade in his left hand and dared the bandits to attack him. He held off the communists for forty minutes, forcing them to withdraw and saved Private Hughes’s life. His citation concluded “So resolute was his demeanour that the bandits, who had maintained their attacks for some forty minutes, and who were now threatened by the other sections, withdrew. The coolness, fortitude and offensive spirit displayed by Awang anak Rawang were of the highest order. Despite being twice severely wounded he showed the utmost courage and resolution to continue the fight and protect the injured soldier.” The insurgents were forced to retreat. Hughes was saved, although the other solider died from his wounds. Ironically, while Awang’s gallantry had been celebrated worldwide, little was known about the Iban hero locally until recently, probably due to lost war records. Awang, still attends the reunion of the Worchestershire and Sherwood Foresters Regiment every two years, has met Queen Elizabeth II, Prince Charles and other British leaders. Thus, I personally proud and grateful that the British government still remembers him until today. Kanang anak Langkau was born in 1945 in Julau, Sarawak. He entered military service with the with the British Army, as an Iban Tracker, attending Jungle Warfare School in Ulu Tiram in early 1962. Kanang was attached to the 42 Comando serving during the Brunei revolt and during the Indonesia-Malaysia Confrontation. He later served with the Royal New Zealand Infantry Regiment. He was absorbed into the Sarawak Rangers which eventually became part of the Malaysian Rangers when Malaysia was proclaimed on 16 September 1963. In the Malaysian Military History he is one of the very few survivors ever conferred the “Seri Pahlawan Gagah Perkasa” whilst still alive and a “Pingat Gagah Berani” the only person has ever received two gallantry awards in the history of the Malaysian Armed Forces. In an operation in the Korbu Forest Reserve at Fort Legap on the 1st June 1979 whilst on a mission tracking the enemy, Sgt Kanang’s group came across a temporary enemy resting camp, he and hid 8th Battalion Royal Rangers immediatedly launched an attack on enemy that far outnumbered their group. Two of the Rangers went down, mortally wounded. Five of the enemy were killed, enemy equipment too were captured. He was conferred the highest gallantry award, the “Pingat Gagah Berani” by his Majesty the King. In another operation, 8th Battalion Royal Rangers was tasked to conduct the follow up on an enemy ambush on a section of soldiers from the 20th Battalion Royal Malay Regiment at Ladang Kinding, Sungei Siput, Perak. One of the follow up groups was commanded by him. Sergeant Kanang who was a skilled tracker managed to track down the enemy. He made contact with the enemy, several of his soldiers were wounded. Even after experiencing casualties, his morale and the indomitable fighting spirit of the Ranger Corps within him remained high. Sarjan(Sargeant) Kanang Anak Langkau was leading the Unit Combat Intelligence Platoon of 8th Battalion Royal Rangers(now known as 8th Paras). This platoon was tasked to track down and destroy a group of communist terrorists who were present in the operational area. Who awhile ago shot dead one soldier in the Tanah Hitam area of Perak on the 8th February 1980. This dogged pursuit and tracking of the enemy took 11 days ! he managed to doggedly track and identify the enemy’s exact route of escape. On the evening of 19th February 1980 at around 1500 hours in the afternoon, after conducting a recconnaisance with great caution and care, his platoon mananged to estimate the location of the enemy, which was located not very far from their location. Actually they were inside the location of the enemy, as they were at the foot of the hill. They only realised that they were inside the enemy’s location when they found a communictions cord from the enemy sentry’s location. This cord was running from the sentry’s location to the enemy’s main force. This cord is normally attached to a small bush or empty cans which make noise when pulled. This way the main force can be alerted by the sentry when an enemy approaches. At that moment Sergeant Kanang was approximately 8 meters from the enemy sentry’s location. Realising that, he launched the assault towards the right by firing towards the right of the enemy along with his platoon. After lauching the attack to the right, it suddenly struck everyone that the enemy’s main force was on the left, below the slope of the hill. Without losing his senses, he switched the direction of fire to the left, at the same time changing the direction of the assault to the left. They ploughed into the enemy, a large force of the enemy managed to escape. The platoon and Kanang on that day managed to bag five Communist Terrorists on that day. Even with that success, they were saddened by the loss of one of their group who was killed and one more seriously wounded.Whilst trying to rescue his wounded friends, Sergeant Kanang himself was repeatedly shot, he took three rounds from the enemy into his body. The will to live and fight another day was strong, he recuperated and was back on active duty. Kanang anak Langkau following the highest fighting traditions of the Ranger Corps was conferred the “Seri Pahlawan Gagah Perkasa” for valour in decimating the enemy on the 3rd June 1981 by his Majesty the King. Kanang retired after 21 years of service as a First Warrant Officer. He was the Temenggong (paramount chief) of the Iban in Sri Aman,his place of residence. He was awarded the Officer of the Most Exalted Order of the Star of Sarawak (PBS) (Malay: Pegawai Bintang Sarawak) in 1987. On 15 April 2009, he made headlines after rescuing a baby orangutan from captivity with his friend, Tay Choon Yong. The baby orangutan was being handed to Semenggoh Wildlife Centre. On 24 September 2011, he was conferred the Commander of the Order of the Star of Hornbill Sarawak (PGBK) (Panglima Gemilang Bintang Kenyalang), with the title of Datuk by the Abang Muhammad Salahuddin, the Head of State’s 90th Birthday. In 2011, Kanang supervised Operation Mai Pulai. This operation involved the locating and exhumation of the remains of 21 Iban Trackers and Sarawak Rangers who were killed during the Second Malayan Emergency. Their remains were exhumed from multiple location on the Malay Peninsula and returned to Sarawak where they were ceremonially reburied in July 2011. On 3 January 2013, he collapsed while watching television at home in Sungai Apong, Sri Aman after complaining of chest pains. Immediately rushed to the Sarawak General Hospital, he was pronounced dead at the age of 68. 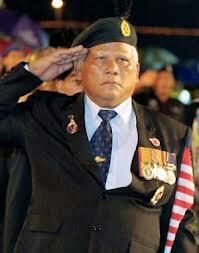 According to the Minister of Defence, Datuk Seri Ahmad Zahid Hamidi, he will be given a national burial. His coffin, draped in the Jalur Gemilang (Malaysia Flag) and the colours of the Malaysian Armed Forces, was first brought to the 1st Infantry Division base located at Bukavu Camp in Penrissen for the family members and friends to perform prayers and miring ceremony (offering ceremony), before being brought to Kuching Civic Centre for the public to pay their last respects. He was buried at the Heroes’ Grave in Jalan Taman Budaya, after the funeral prayers at St.Thomas Cathedral in Kuching. A Malay language novel used in secondary schools in Malaysia called Kanang, Cerita Seorang Pahlawan (“Kanang, The Heroes Story”), written by Mazlan Nordin, is a story about Kanang anak Langkau.